In the days before the race at Suzuka the FIA Court of Appeal ruled that the Ferraris had been legal at the Malaysian Grand Prix. That meant that McLaren and Ferrari were going head-to-head for both World Championships. Ferrari's Eddie Irvine was four points of ahead of McLaren's Mika Hakkinen in the Drivers' title and Ferrari was four ahead in the Constructors'. Michael Schumacher did well in qualifying to take pole position but he was nowhere near as quick as he had been in Malaysia a fortnight earlier. Hakkinen was second on the grid with his McLaren team mate David Coulthard third and Heinz-Harald Frentzen fourth in his Jordan-Mugen Honda. Irvine was only fifth. The Ulsterman could only hope that Schumacher would win the race and take points away from Hakkinen. Hakkinen beat Schumacher away at the start and it was obvious that the Ferrari could not match the McLaren. Coulthard ran third for a long time but then made a mistake, tore the nose off his car and had to pit. That ended McLaren's hopes of the Constructors' title. Coulthard rejoined and Schumacher later made a fuss about being held up by the lapped Scotsman, but there was little substance to the allegation. 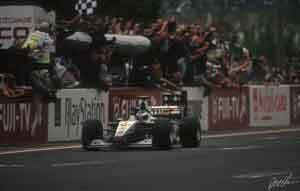 Hakkinen drove a fabulous race and duly won to take the World Championship. Schumacher was second with Irvine third, a minute and a half behind. Frentzen was fourth with the final points going to Ralf Schumacher and Jean Alesi in his last race for the Sauber team.